Market participants have been coalescing around the view that the Federal Reserve’s liftoff from near-zero interest rates will be a “one and done” affair. That is, market metrics suggest that monetary policymakers will likely hike rates once, then wait a considerable time to assess how financial markets and the real economy digest this less stimulative stance. But in an appearance on Bloomberg Surveillance, Kenneth Rogoff, Harvard professor of economics and public policy, questioned the rationale of this view. Of course, today’s mess was many years in the making and there is no easy, painless exit strategy. But the need to introduce more banking discipline is yet another reason why the policymakers must refrain from excessively expansionary macroeconomic policy at this juncture and accept the slowdown that must inevitably come at the end of such an incredible boom. For most central banks, this means significantly raising interest rates to combat inflation. For Treasuries, this means maintaining fiscal discipline rather than giving in to the temptation of tax rebates and fuel subsidies. In policymaker’s zealous attempts to avoid a plain vanilla supply shock recession(! ), they are taking excessive risks with inflation and budget discipline that may ultimately lead to a much greater and more protracted downturn. So, the “capsizing” of the economy that was just beginning when he wrote was the fault of “too easy” monetary (and fiscal) policy! So far the former and wannabe Fed Chairmen crossed swords over the irrelevant and misguided concepts of GSG & SS. (I´ve given those things some thought here and here). There’s been a really interesting back and forth between Ben Bernanke and Larry Summers over secular stagnation. I agree with most of what both have to say. But there’s a substantive difference in views, in which Bernanke correctly, I’d argue, criticizes Summers for insufficient attention to international capital flows – but then argues that once you do allow for international capital movement it obviates many of the secular stagnation concerns, which I believe is wrong. As it happens, the role of capital flows in the logic of liquidity traps is an issue I tackled right at the beginning, back in 1998; and I’ve been trying to work out how it plays into the discussion of secular stagnation, which is basically the claim that countries can face very persistent, quasi-permanent liquidity traps. So I think I may have something useful to add here. Start with Bernanke’s critique of Summers. The most persuasive evidence that the US may face secular stagnation comes from the lackluster recovery of 2001-2007. We experienced the mother of all housing bubbles, fueled by a huge, unsustainable rise in household debt – yet all we got was a fairly unimpressive expansion by historical standards, and little if any inflationary overheating. This would seem to point to fundamental weakness in private demand. But one reason for the sluggish growth in demand for U.S.-produced goods and services was a huge trade deficit, the counterpart of huge reserve accumulation in China and other emerging markets. So Bernanke argues that what Summers sees as evidence of secular stagnation actually reflects the global savings glut. The 2001-2007 recovery is not evidence, let alone persuasive, of secular stagnation. Krugman is on the right track when he says this “would seem to point to fundamental weakness in private demand.” But at the last minute he veers off in the wrong direction by making the fundamental mistake of “reasoning from a (GDP) component change” (a close cousin of “reasoning from a price change”). A huge trade deficit somewhere is always the counterpart of a huge reserve accumulation elsewhere. The important reasoning is to discover why this came about when it did and if it might be related to other stuff (such as the US housing boom). For an explanation, read here (below the fold). 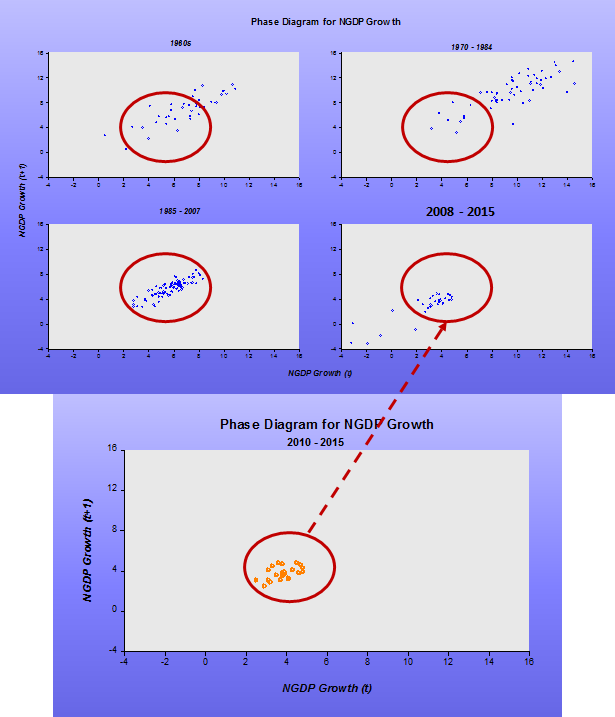 If “movements in GDP components” had not distracted Krugman he would probably have found out that the post 2001 recession recovery was slow up to mid-2003, being due to the tightness of monetary policy, despite fast falling interest rates. When the Fed made monetary policy more expansionary in mid-2003 by adopting forward guidance (FG), despite interest rates remaining put, the recovery took off, with nominal spending rising back to trend. Interestingly, many see this strong growth in nominal spending as reflecting a “loose/easy” monetary policy. Grave mistake. 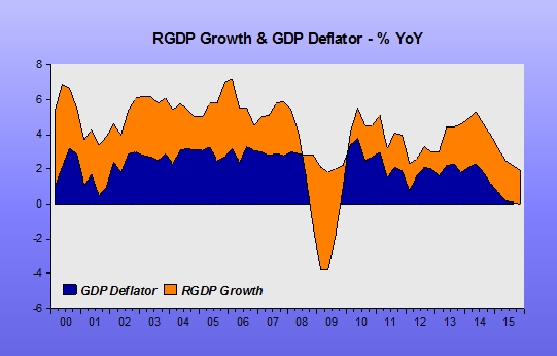 Faster NGDP growth was necessary to take nominal spending to trend. 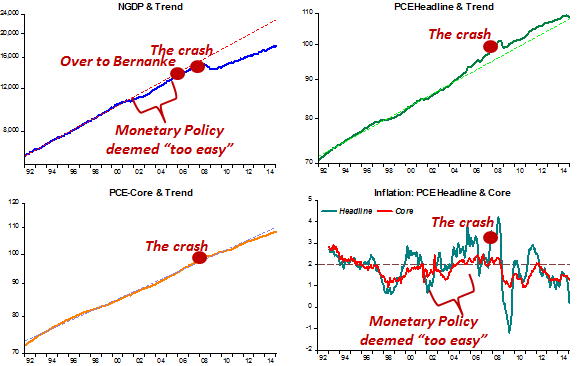 Monetary policy was “just right”! 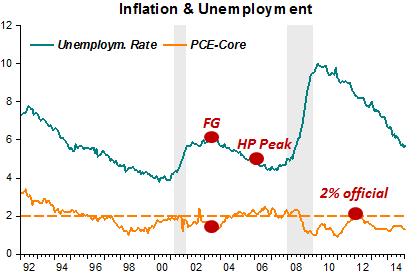 At that point, unemployment begins to fall and core inflation rise towards the “target” level. Bernanke had the bad luck to take over almost concomitantly with the peak in house prices. Initially house prices fell only a little, increasing the speed of fall after financial troubles erupted in some important mortgage finance companies. 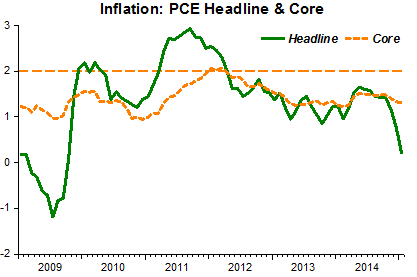 Unfortunately, the Fed was exceedingly focused on headline inflation, fearful of the oil price rise. Interest rates remained elevated, only being reduced after August 2007, when three funds from Bank Paribas folded. However, the pace of interest rate reduction was deemed too slow by the market. In the December 11 2007 FOMC Meeting, for example, the markets were negatively surprised by the paltry 25 basis points reduction in the FF rate. On that day the S&P fell 2.5% and the 10 year TB yield dropped 17 basis points. Rate reductions stopped in April 2008 (only resuming in October, after Lehman!). In the June 2008 FOMC, it came out that the next move in rates was likely up! With all this monetary tightening, nominal spending decelerated and then fell at an increasing rate. One casualty was Lehman! The rest is history! Give me a break and let´s stop talking “Gluts” and “Stagnations”. Bernanke would do much better if he starts shinning some light and blog about how monetary policy could really have been much better! Will he be daring? …The issue of a target price level (PLT) versus target inflation rate (IT) nonetheless remains. Compare the goal of being close to a target price level that is growing at 2% per annum from a given date, say 1995, with the goal of achieving a 2% inflation rate each year from 1995 on. With a target price path (PLT), the monetary authority attempts to offset past errors, thus creating more uncertainty about short-term inflation rates than with an inflation target (IT). The gain is more certainty about the long-term price level. My present view is that the inflation target with its greater short-term inflation rate certainty is preferable, despite its greater long-term price level uncertainty. I thought that view was “narrow-minded”, in particular given that important firm and individual decisions tend to be longer term ones. Does Fischer still hold those views from 20 years ago? So by Fischer´s own definition we haven´t experienced “price stability” for several years, implying a lot of uncertainty about “short-term inflation rate certainty”. In fact, “long-term price level uncertainty has been lower than short-term inflation uncertainty”, especially if you associate the price level with the core measure of the PCE. As the panel below shows, core prices evolved very close to trend until 2012, after which they fall a little short. The headline price level was impacted by the persistent oil shocks during 2003-08. More recently, the negative oil shocks have brought it back to trend. Meanwhile, core inflation has spent most of the time below the target (initially implicit) level. From a PLT perspective, the Fed is doing OK. From an IT perspective, it is doing a pretty awful job. But note that trying to “correct” inflation (bring it to target) will likely “disturb” the PLT (at least the headline price level). But the Fed doesn´t target the price level! In 2008 the Fed botched the job because it became “afraid” of the increase in headline inflation that was rising on the heels of oil prices. That shows the main deficiency of both IT and PLT. Both are sensitive to real or supply shocks. Since the Core measure of the price level is much less sensitive to supply shocks, the fall in the core price level below trend over the past few years is an indication, contrary to FOMC conventional wisdom, that the drop in inflation is due to more than recently falling oil prices! Would that be related to a monetary policy that is implicitly tight? On that score, the panel also shows that the major factor behind both the depth of the recession and the weak recovery was the Fed letting nominal spending drop way below trend and then not allowing it to climb back towards trend, i.e. keeping monetary policy too tight! 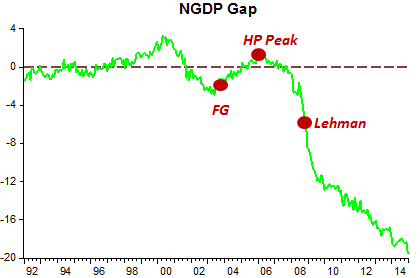 The NGDP & Trend chart is also evidence that the prevalent view that monetary policy was “too easy” in 2002-05 is misguided. 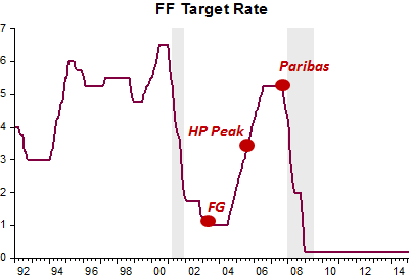 With the FF rate at 1%, in August 2003 the FOMC decided to undertake forward guidance. All measures of inflation were below the target, and so was the NGDP level. It was effective in bringing both NGDP and core inflation back to target (headline was impacted by oil, and that shouldn´t concern the stance of monetary policy). Bernanke took over with a “clean slate”! And proceeded to botch the job! Unfortunately, those responsible for monetary policy simply won´t recognize the need for an overhaul in how monetary policy is conducted. Simply “endowing” the inflation target with more flexibility, imposing interest rate rules (aka “Taylor-type” rules) or even adopting a PLT won´t cut it. One of the consequences of this “hard-headedness” will be increasing claims for the use of distortionary fiscal policies (“stimulus”). In this lecture, I present preliminary lessons – nine of them – for monetary and financial policy from the Great Recession. I do this with some trepidation, since it is possible that there will later be a tenth lesson: that given that it took fifty years for the profession to develop its current understanding of the monetary policy transmission mechanism during the Great Depression, just two years after the Lehmann Brothers bankruptcy is too early to be drawing even preliminary lessons from the Great Recession. But let me join the crowd and begin doing so. LIKE most other central banks, the Reserve Bank of India (RBI) has a schedule for its monetary-policy meetings—firm dates on which its top brass gathers to consider changing interest rates. But much of the important action is now taking place between such meetings. On March 4th, the RBI cut its main interest rate by 0.25 percentage points, to 7.5%, the second such reduction in three months. Like the previous cut, in January, it was made outside the bank’s normal cycle of meetings. Is anxiety about the economy making the RBI trigger-happy or does something else explain this? The previous interest-rate cut in January came days after figures showing consumer-price inflation had risen by less than expected in December, to 5%. 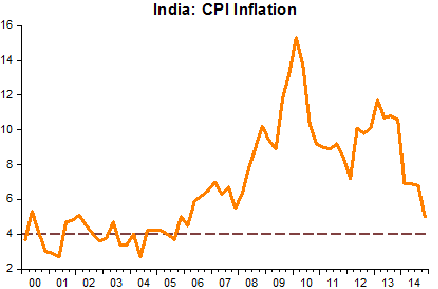 That left the RBI comfortably on track to meet its self-imposed goal of bringing inflation below 6%. So it decided to act quickly. The second unscheduled cut two months later seemed as if it might have been a thumbs-up for the budget presented on February 28th by Arun Jaitley, India’s finance minister. The RBI’s governor, Raghuram Rajan, had said before that further interest-rate cuts would depend on the government’s fiscal rectitude [I´ll offset you]. But on this occasion action was spurred by the publication a day earlier of a three-page framework agreement with the government that set the RBI a formal inflation target. 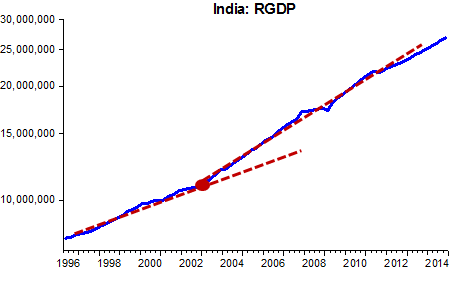 Instead of an inflation target, India could have “innovated” and chosen an NGDP level target! The chart shows that it´s not too far “off target”. 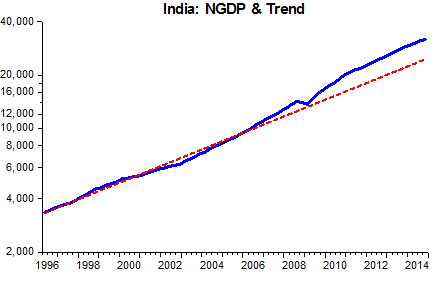 Actually, it wouldn´t have to bring NGDP down to the original trend level, because it´s quite likely India´s trend level has risen somewhat. In the next chart, you can glean that real trend growth shifted up after 2003, which would increase the “optimal” nominal spending level. The RBI said in a statement on March 4th that it needed to act outside the normal policy-review cycle for two reasons. First it ought to quickly offer guidance on how it would go about its new task now that the remit was public. It said that its aim was not to get inflation to 4% by the start of 2016-17 but rather to reach that target two years hence. In other words, it is pursuing a gentle glide-path to the 4% target so as to minimise the output costs getting inflation down.